"The Intel Core i7 Review - Which Core i7 Processor is Most Suitable For You? Find Out Now!" Before we go for the Intel Core i7 review, it's good to let you know why Intel Core i7 are the best processors out there. Read more on Intel Core i7 processor features. Whether you're a serious multitasker or a multimedia enthusiast, performance matters. So why limit yourself? Unlock your full potential with the ultimate smart performance of the Intel® Core i7 processor. How to choose a Core i7 processor that best fit your needs? When selecting a CPU for your computer, always consider your computing needs. The Core i7 are high-end processor that currently are target for high-end users such as gamers, and those that required CPU intensive work such as working with video editing or programs such as AutoCAD, photoshop, etc. Beside from that, the following are some other factors that you need to take into considerations when getting a new CPU. If you are aiming for the best performance, the newer CPUs will be more expensive and the latest or newest CPU will be very expensive. Try to wait sometime after the processor is released and the price will drop dramatically. Average users should not purchase the top-speed CPU on the market. The price difference is not worthy of the performance difference. So when trying to decide what is right for you figure out your budget then decide which processor best fits your price range. If you are advanced users, then overclocking the CPU is very common. However, it should not be attempted by novice computer users. Overclocking is a way to change the settings to make the CPU run faster than it original speed. All the Intel Core i7 processors can be overclock to run even faster than normal speed. Choosing motherboard and the type of CPU socket on it is important as you need to get a motherboard that supports higher than the processor and memory (RAM) you are going to choose. This way in the future it's easy for you when you decide to upgrade processor or RAM to make your computer run faster. The CPU socket type on the motherboard (such as PGA 1366) can still be used when you upgrade to a newer CPU. Now, Which Intel Core i7 Processor is Worth Your Money? Socket LGA1366 allow future upgrade. Three-year limited warranty. Four 3.06 GHz cores for better multitasking and multithreaded performance. Quick Path Interconnect (replaced Front Side Bus) provides fast data transfer between the processor and chipset. Great performance with reasonable price, easily can overclock the CPU to 4.0GHz or even higher. Item can be shipped only within the U.S.
Price slightly higher compare to the same range of AMD processor. As you can see, Intel has completely reinvented their CPU design, removing the older Front Side Bus and replacing it with the new Intel Quick Path Interconnect, delivering up to 6.4 Gigabytes per second. The new to the Core i7 line is the integrated memory controller, supporting Triple Channel DDR3 Memory allowing for more maximum memory, up to 24GB of RAM on some boards, and faster access times. Located directly on the CPU die is 256KB per core of L2 cache and 8MB L3 cache shared across all four cores means the CPU can do more without having to access the main memory, further increasing performance. Deep testing has been carry out and it show the incredible benchmark performance and rock solid overclock ability. With the current prices on this Core i7 950 processor that are below $300, I can't see a better value out there on an Intel chip if anyone plans to overclock. 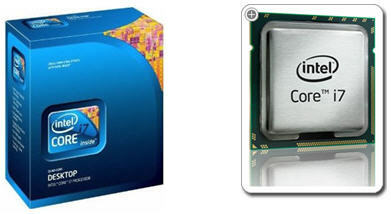 The Intel Core i7 950 3.06GHz 8MB L3 Cache processor is on sale at Amazon now. Click here to check it out. Now that you've read my Core i7 950 processor review, it's not hard to see why this CPU is a great choice. Your computing or gaming experience will be change with this outstanding i7 processor. All things considered, the Core i7 950 processor is a great CPU and I think you will be very pleased with it. I cannot believe that ALL the user's that purchased this i7 950 processor and reviewed it - give a 5 out of 5 star to this processor. So, this is no doubt that this CPU can really delivered what you want!! There are several i7 series of processor that you can choose from if you wish to build an extremely fast computer with super great performance. You can read more reviews on these processors at Amazon by clicking here.